Japan's space agency confirmed Friday its Ikaros mission successfully unfurled a solar sail nearly 5 million miles from Earth, but it could be much longer before officials confirm whether the craft is being accelerated by the power of sunlight. The final deployment of the sail membrane came Wednesday, but the Japan Aerospace Exploration agency waited to receive confirmation of the event before announcing its success in a press release Friday. 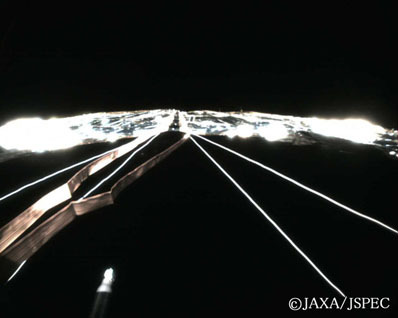 JAXA also distributed images from cameras mounted aboard the spacecraft showing the ultra-thin sail deployed as planned as Ikaros traveled nearly 5 million miles from Earth. Ikaros launched on an H-2A rocket last month along with Japan's Akatsuki probe bound for Venus. While Akatsuki will enter orbit around Venus, Ikaros will fly by the planet and continue circling through the inner solar system. The kite-like sail was deployed in two steps beginning last week. Guide weights first pulled the membrane from its canister as the spacecraft spun at 25 rpm. The centrifugal force from the spin helped extend the folded sail in four arm-like packages extending from the drum-shaped craft like spokes in a bicycle wheel. The first stage deployment sequence started June 3 and finished Tuesday. JAXA slowed the operation to be more cautious during the tricky procedure. The sail has no rigid support frame, and the lightweight membrane was prone to snags as it was released. The last phase of the sail's deployment was commanded Wednesday, when holders constraining the bundled membrane were ordered to release. Controllers initially confirmed its success as the spacecraft's spin rate decreased as predicted, and images from Ikaros now show the structure is properly positioned following the deployment, according to JAXA. Now that the sail is unfurled, Ikaros' spin rate will remain at 1 or 2 rpm for the rest of its mission. Small solar cells covering part of the sail membrane are already producing electricity, JAXA said in a statement Friday. 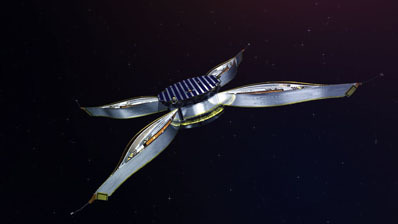 The sail's successful deployment and power generation achieve the mission's minimum success criteria, but more trials are planned in the coming weeks to verify the sail is being accelerated by light pressure from the sun. JAXA will track the craft's trajectory through the inner solar system, attempting to detect small changes in its velocity that can be attributed to the sail. 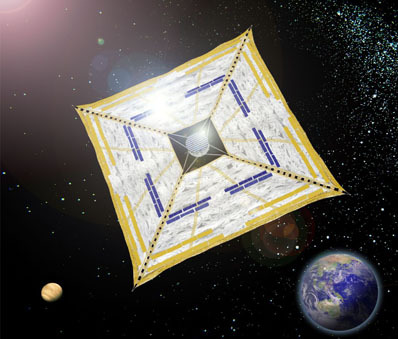 Solar sails work by harnessing particles of light from the sun and converting the energy into propulsive force without the need for conventional chemical fuels. The concept is similar to the use of wind to drive sailboats. If the Ikaros sail works as expected, Japanese engineers could attempt to tilt the membrane's angle to change the spacecraft's orientation and prove new navigation techniques. The technology has never been demonstrated before, but if it works, solar sailing would provide a renewable resource to propel future missions farther and faster into space. Lasers could one day be focused on sail-like structures to accelerate spacecraft beyond the solar system.